If you've been to the pump anytime in the last 10 years, you might have noticed that diesel fuel is one of the most expensive fuel options currently available. This might lead you to wonder why it is that some vehicle owners elect for buying a car that runs off a diesel engine instead of investing in a considerably less costly gasoline options. There was a time when the cost of diesel fuel was actually less than that of gasoline. Prior to 2004, diesel engines were a hot commodity, especially among owners of larger vehicles like trucks and SUVs. As diesel fuel increased demand, the process in which the fuel was refined had to change. This high demand and evolution in technology is largely what caused diesel prices to surpass gasoline; however, higher prices have yet to deter most vehicle owners who have fell in love with their diesel vehicles. 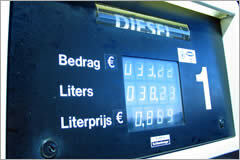 What diesel may lack in total price, it makes up for in other factors. Here are some of the most significant pros and cons of owning a diesel engine if you are in the market to buy a used import vehicle and can't decide which fuel source you'd prefer. Diesel engines are built to be powerful, which is why they are used in most construction and freight shipping industries. They are also about 30-35% more efficient when it comes to how much fuel they need to use compared to that of gasoline engines. The reason being is that diesel has a denser chemical makeup than gasoline so it is able to burn less of the substance to achieve the same job. The cost of a car operating with a diesel engine will generally be higher than if you were to buy a car with a gasoline engine. Diesel engines are larger and you can expect to pay roughly $5,000 more on your auto purchase with a diesel engine. You should also expect any repair work that needs to be done on a diesel engine will also cost you a bit more than a gasoline alternative. Although diesel engines have gotten a bad reputation from environmental groups, studies have shown that diesel engines are actually less toxic to the environment than gasoline. Since diesel engines are more fuel efficient, the number of harmful chemicals like carbon dioxide that are produced due to the burning process are far less. Diesel engines do emit soot and a harmful chemical called NOx, but modern filters that are installed on diesel vehicles are able to largely reduce the amount being released into the environment. Diesel engines might be fuel-efficient but they definitely don't have any noise reduction properties. Cars that use diesel engines don't need spark plugs to ignite the fuel because the fuel is designed to spontaneously combust within the engine when it is introduced to high heat. This explosion is what makes these engines so noisy and provides them with the rumbling noise that is most often characterized by diesel vehicles. Because diesel engines are designed to be able to handle these combustions, they need to be very durable and able to withstand the heat. This high quality build can last much larger than any gasoline engine without worrying about any type of repairs. The record for the longing lasting diesel engine without requiring engine repair was Mercedes Benz who built a diesel vehicle that last for over 900,000 miles. In addition with withstanding the noise of a diesel engine, the combustion and rattling also make a diesel engine less comfortable to ride in than a gasoline car. New technology is reducing the vibrations and noise that used to be experienced in diesel operated vehicles, but there is still a long way to go.